Building a Bumble Bee House: Constructing a bumble bee house is a fun project that takes between 45 and 90 minutes to complete. 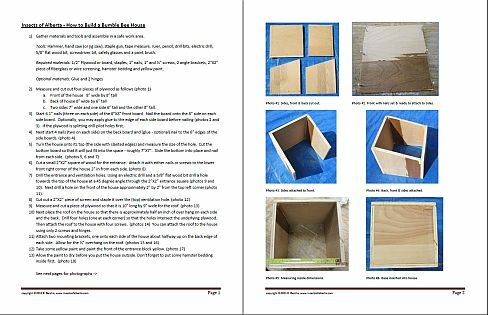 By clicking on the link below the picture you can download and print out a set of instructions and photographs that will guide you through the project. Optional Ideas: If you are handy, you can build smaller or different shaped Bumble Bee Houses. To make the joints stronger consider gluing them. This will also make them more weather proof. Attaching the lid with hinges is an option if you want easier access to the inside of the house. Important: It is very important that the roof overhangs the entire house to keep water out. Also the base must be inside of the walls to prevent water seeping in at the bottom. Damp/moldy nesting material is not a popular nesting choice with Bee colonies. Click Here to View Instructions on how to "Build a Bumble Bee House". These Instructions require Acrobat Reader.